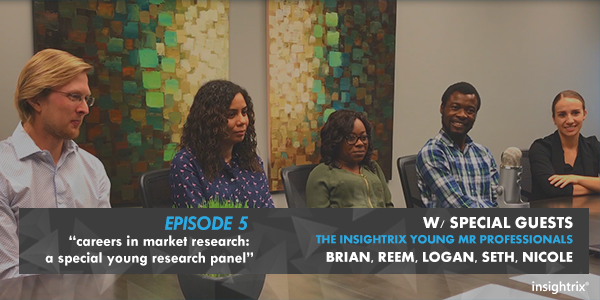 In this fifth episode of Stories of Market Research, we sit down with a panel of young research professionals who are a part of the Insightrix team to listen to their perspectives and points of view on what it’s like to be a young research professional working in their careers in market research. These young research professionals offer up some of their unique experiences and perspectives as they have worked to begin their careers in MR, and some of the tricks of the trade they’ve picked up over their years on the job and share some of the challenges they’ve faced and overcome, the skill sets and credentials that have helped them secure their positions and to be successful in them, and give us an idea of what a day in the life of an MR professional looks like. If you’d like to put a face to the names you hear on our podcast, check out the extra bonus video we produced. It’s also available on the Insightrix YouTube Channel. We are also joined by Insightrix Research Director, Lang McGilp, for a chat about how market research has changed over the years in both practice and the tools used to do it. Lang also provides insight for young researchers looking to enter the field of market research in regards to the skillsets, education and specializations that will help them stand out when they look to pursue their new careers in market research. The newest episodes of Stories of Market Research: The Insightrix Podcast are always available on our website player, and on the podcast listening application you like best – iTunes, Google Music, Stitcher, PodBean and SoundCloud. Be sure to subscribe to never miss an episode.